One very basic definition of catfishes is that they have barbels, sometimes they are called whiskers or even feelers. One of the most beautiful examples of this adaptation can be found attached to the featured species this month. I have been blogging about catfishes since the 1990s; it is ludicrous to me to consider that I mention this for the first time in 2015 – but it's something I've often thought about. The Algerian born, one time goalkeeping French novelist, essayist and playwright, Albert Camus, wrote, “A man's work is nothing but this slow trek to rediscover, through the detours of art, those two or three great and simple images in whose presence his heart first opened.” Philosophical stuff indeed, but the meaning is simple – in younger years you see, or perhaps experience, a few things that really affect you, one way or another. Camus had a positive outlook and so meant this in his quote. The first time I saw this species it was only the barbels that I saw. On my weekly pilgrimage to a favourite Edinburgh fish store I was left wondering what was attached to the business end of the barbels. The remainder of the fish was hiding in a large horizontally placed terracotta pipe. The barbels were hypnotising. Slowly casting to and forth like a languid fly fisherman safely concealed in the dark hole provided by the pipe. This fish was being kept with some other large cats underneath an Arowana (Osteoglossum bicirrhosum) in the shops biggest display tank. I never saw it feed, but I got the distinct impression it was looking all the time. Watching, waiting, ready to pounce. This is the way with all pimelodid catfish, the hungrier they are, the more active they become. Those with long barbles are more ambush hunters, those with shorter ones cruise and feed more like sharks. This, again, is a considerable generalisation, but it remains a useful rule of thumb for those interesting in keeping such fishes in the aquarium. At not much more than 2ft (24”) in adult length, this is one species that can be considered for the home aquarium. A bit like a 60” TV however, it will look a bit silly unless you've got a large living room. So, large tanks are the order of the day especially if we consider that this fish should be able to sit at rest without more than one of its long barbels touching glass. If you're happy you have the dedication, space and financial resources to run that kind of aquarium for at least a third of your life, then go for it! Much is made of the size of tank larger fishes should be kept in. I'm quite sure there are many out there who can run large to enormous tanks. However, the key point for me is three and not two dimensional. I would consider that if can you be reasonably sure you can keep up the water changes and the power bill while your hair thins a little, then all good. The answer will be different for different people. Some might live house with a basement where they will be for the remainder of their lives more or less, some might live where it is warm enough to cheaply run large ponds. Some might have the dedication and money to run public aquaria sized set-ups. Thus there are those who would benefit from information on this species. However, it would seem likely they would have done their research. So, perhaps this article is aimed at the younger or less experienced fishkeeper. To provide them with some thought on when they might try this species, for it is a truly lovely one, but perhaps consider the longevity issue before the tank size issue. If such a fish enters into your care and you have any kind of, “well I can trade or give it away” then I would suggest you need to look at less ambitious projects. These are not expensive fish to buy, they are expensive fish to keep. We cannot discuss this species without talking about Perrunichtys perruno. An enigmatic, monotypic but similar species from Venezuela. But, not from the Orinoco. It is from the Maracaibo basin. That is an area that both tends to have endemic fishes and is neither in great ecological shape nor a source of ornamental fishes. Fishes offered for sale as Perrunichtys are without recorded exception Leiarius marmoratus. Typically, these fishes are acquired at a small size and bringing them on in a small tank is great fun. At this size they should be offered as much prepared food as you can manage. Frozen bloodworm and the odd earthworm will bring them on quickly. The temptation might be to offer feeder fish but typically these are neither healthy nor sustainable options. As the fish grows, you can feed farmed Pangasius, Tilapia, Oncorhynchus and seafood like prawns, mussels and cockles. If you have a local Chinese supermarket, check that out for these things but try to avoid feeding marine fishes if you can. While this species has not been bred in the aquarium, it is farmed as a food fish using artificially egg stripping technique. If you have the space, this species will do well with others but is a messy eater. 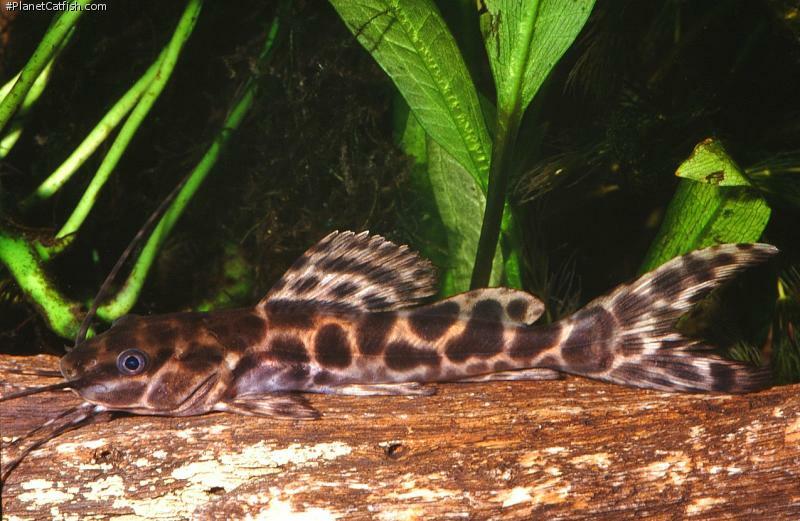 Consider a pleco or good sized but not too feisty Synodontis as tankmate number one and then go from there. When housing with any other catfish, ensure that other species won't injure the scaleless piemlodid by ensuring there is no competition over territory and preferred hiding spots. If you decide to commit to this species, in return for providing a big tank, good food and the requiste husbandry you will be rewarded with a relationship that will span many years if not a few decades. Etymology The genus name is derived from Leios, meaning smooth and Arius which is a Greek for "dealing with Mars, warlike, belliose". It's the name of another catfish genus, so the combination is "smooth Arius". This specific epithet refers to its long (longus=long) barbels (barba=barbel). Identification Often confused with the rarely, if ever, encountered Perrunichthys perruno. The fishes are identical in terms of colouration although P. perruno has 8 (1 hard and 7 soft) dorsal fin rays, Leiarius has 10 or 11. Also similar to L. pictus, these two can be distinguished by L. pictus having a larger dorsal fin albeit this feature reduces with age. General Remarks There is some history of confusion in the Leiarius genus. L. marmoratus was for some time a synonym of L. longibarbis, but it was taken out of synonymy by Ferraris in his Catalog of Catfishes (2007). Fish are still sometimes seen as L. longibarbis, but most likely they are L. marmoratus. Other Parameters Requires clean, regularly changed water can become listless and loses appetite if a regular water change regime is not adhered to. Feeding Young fish will eat virtually anything, especially small tankmates. As the fish matures it should be fed less often and periods of fasting will maintain the fishes health as well as provide the aquarist with a more active pet. Aside from large catfish pellets, feeder fish, crab, prawn and crayfish are also taken. The more adventurous aquarist may also try large earthworms, maggots and small cubes of raw beef heart (taking care to remove all traces of fat). Furniture Large, thick branches or bogwood roots to provide cover over a rounded large pebble base is ideal. Sand is often ''re-arranged'' by larger fish and coarse gravel can irritate or even damage the fish. An open area for night time exercise should also be provided. Compatibility Peaceful, although care should be taken to house with appropriately sized tankmates. References Proceedings of the Academy of Natural Sciences of Philadelphia v. 22. There are 53 registered keepers, view all "my cats" data.